The Volkswagen Touareg was created from a desire to make a high-end sport utility vehicle that was extremely capable as well. With a leather-wrapped steering wheel, luxurious power adjustable front seats, and dual-zone climate control, your drives will be more than comfortable. Available features include a Dynaudio premium sound system on the Executive trim, and a navigation system with 3D maps on all excluding the base V6 Sport. For your gear, fold the rear seats and you have 64 cubic feet of cargo space to fill. Plus, with the Hands-free easy-open liftgate, available on several trims, just stick your foot under the rear bumper, and it opens. Most models get a push-button start, and if you opt for the Executive or Hybrid trims they come with an Area View 360 degree exterior camera system. Plus the R-Line has been added with items like stainless steel pedals, 20-inch aluminum-alloy wheels, a Sport suspension, and distinctive bumpers. All Touareg trims can be purchased with your choice of a 3.6L V6 with 280hp and 265 lbs-ft of torque, or a 3.0L V6 TDI Engine with 240hp and 406 lbs-ft of torque. The TDI gets an impressive EPA estimated 29 MPG on the Highway as well. The gas and diesel models are coupled with an 8-speed automatic transmission with Tiptronic, Dynamic Shift Program, and sport mode. The Touareg Hybrid not only has a supercharged hybrid powertrain, but it packs a powerful punch with a combined output of 380hp and 428 lbs ft of torque. 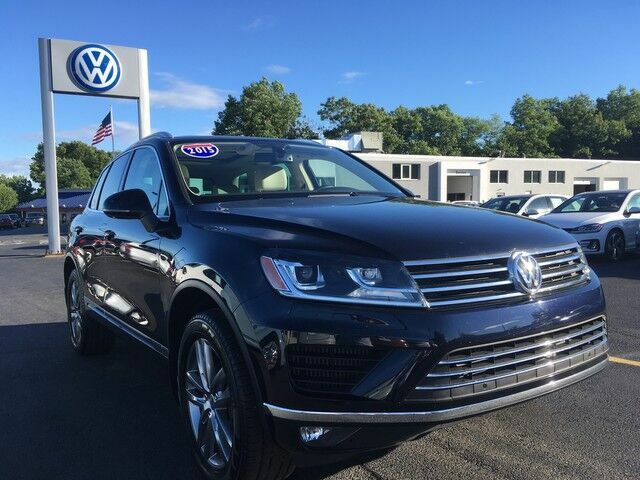 With a 7,700 lb towing capacity and 4MOTION all-wheel drive the Touareg is ready for adventure. There are many safety features as well including items like stability control, a crash optimized front end, anti-lock brakes, and an intelligent crash response system.